ein hod: Janco's Fake or Ben-Ami ad. The painting, supposedly attributed to Marcel Janco - a prominent founder of the DaDa movement and a renowned 20th century Israeli painter( and ein hod founding daddy) - was brought to Hammersite's gallery for examination not long ago. After careful inspection, Hammersite's expert and appraiser Michael Ben-Ami revealed it as a sophisticated forgery. 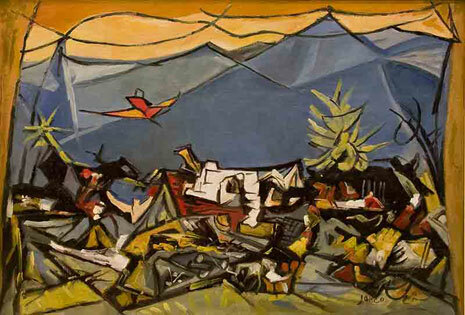 The painting in question was an almost impeccable copy of Janco's 1945 "A Burnt Village," which was a notable part of the Histadrut's collection and was auctioned by "Ben-Ami auctioneers" (now known as Hammersite) in 1996. The painting had been executed on an original old canvas, which was scraped off to reveal the lower surface and thus instill a feel of authenticity. Despite its deceptive appearance of genuineness, it had been signed in English, as apposed to the original signed in Hebrew. It was also evident by the minor color variations and lines indiscrepancies, that the forger had attempted to create an "authentic" variation of Janco's "A Burnt Village." However he wasn't sophisticated enough to realize no artist paints exact replicas while making versions of the same piece. Moreover, it was obvious the forger could not imitate Janco's robust and rich brush strokes, leaving the fake pale and muted in comparison to Janco's dramatic work. שתיים מתוך ארבע היצירות של מרסל ינקו שנגנבו לפני כשבועיים ממוזיאון ינקו דאדא בעין הוד נמצאו והוחזרו למוזיאון. ביום רביעי הגיע אדם לבית המכירות הפומביות "בן עמי" בתל אביב והציע למכירה את הציור "דיוקן עצמי" של מרסל ינקו. הוא סיפר שהוא מתווך מטעם אדם אחר, שקנה את הדיוקן העצמי וכן קולאז' דאדא. בעל בית המכירות זיהה שמדובר ביצירות שנגנבו ממוזיאון ינקו ושיכנע את הקונה לפנות למשטרה.